The Maritime Operational Centre in Høvik from where remote surveys are being carried out. Leading classification society DNV GL announced today that all DNV GL classed vessels are now able to utilize the possibility of remote surveys for some inspections through the Veracity data platform. This means that for a range of surveys, a DNV GL surveyor will not be required to travel to the vessel. Instead, by using an online connection or video streaming link, a dedicated team of remote surveyors can provide support to vessels anywhere in the world with documentation, images, video (streaming or recordings), and input provided by the customer and crew. 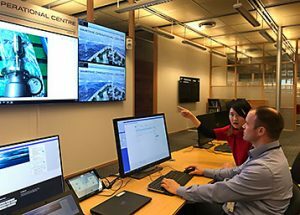 “This is another big step forward in using the power of digitalization and increased connectivity to deliver smarter and more efficient services,” said Knut Ørbeck-Nilssen, CEO of DNV GL – Maritime. More than 1,000 remote surveys were completed in the pilot and scaling up phase by the Direct Access to Technical Experts (DATE) units based in the Maritime Operational Centre in Høvik, alongside units in Hamburg, Singapore, Houston and Piraeus. Technology testing began in 2017, with the first production pilots in June 2018, and now the entire DNV GL fleet is able to take advantage of the service. “Our technical team and senior management recently met with DNV GL at their Maritime Operational Centre in Høvik and were impressed with the demonstration of the society’s infrastructure and technology to support their remote survey capability,” said John Ramage, Chief Operating Officer of International Registries, Inc.
“The Marshall Islands Registry recognizes this is an innovative solution and is pleased to support DNV GL in improving service delivery to our mutual clients,” he concluded. When a customer makes a survey request through DNV GL’s fleet portal on the Veracity platform, they may, for some survey types, be given the option by the system to choose to carry out the survey remotely. All such survey requests are then evaluated by a remote surveyor to make sure that the survey can be offered remotely. The remote survey regime has been constructed to ensure that the level of assurance is equivalent to an onboard survey. “We are running the remote surveys through our popular DATE hubs,” said Knut Ørbeck-Nilssen. “This gives us consistency in how the surveys are handled and the ability to offer around the clock service anywhere in the world at exceptional quality levels.